It is hot. We do not have air conditioning in this house. I do not want to be in the kitchen. But then the new issue of Food & Wine shows up so here I go, into the kitchen. I had picked up a few zucchini from Hearty Fork Farm last weekend which I did not use during the last TK dinner event. 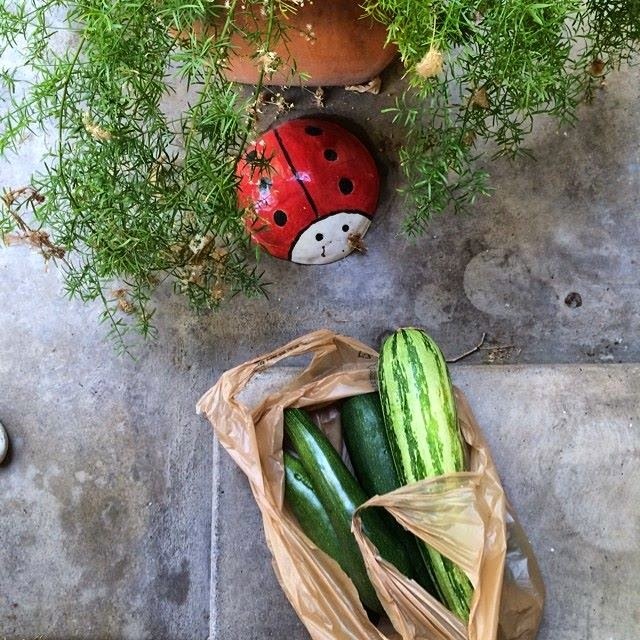 And then today my neighbor left another bag of zucchini on my porch. How cute are my neighbors? I've made a few recipes out of this issue already (for last weekends TK event) But decided I would share this soup recipe first. I know. I just said it is HOT and here I am making soup. Welcome to my addled little brain. And then a friend of mine said "it NEEDS bacon!" In a medium soup pot, heat the butter and olive oil. Add 1 1/2 teaspoons of salt and 1 teaspoon of pepper. Turn heat down to medium and simmer another ten minutes or so. Puree the entire thing - I used my immersion blender, but you can use a regular blender and just do it in batches. Taste, then add more salt and pepper as desired.